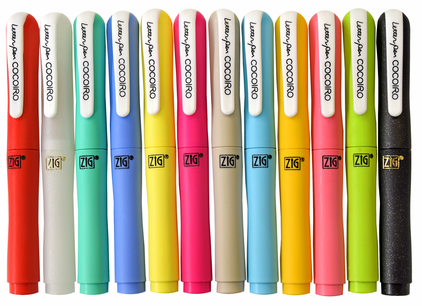 Customize your pen exactly the way you want it with the Zig COCOIRO! The Japanese words kokoro (“heart”, “mentality”, and “feelings”) and iro (“color”) were brought together to create the name Cocoiro for these special pens that allow you to choose each part of the pen to match your heart, mind, and feelings – from the solid colors of the pen body, to the unique style of the tip, to the ink color of your choice. Mix-and-match any color and style of the pen that best expresses your unique creativity! Refills with multiple ink colors and tips make it easy to change your pen whenever your project calls for something different. Choose from ball point, brush, or an extra fine flexible semi-hard tip that helps to create various styles of writing!